Do you consider research outside established paradigms valuable? 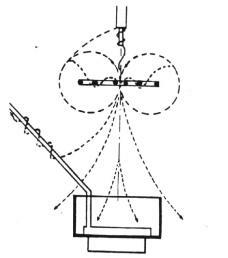 - or Kelvin’s water-drop electrostatic generator. 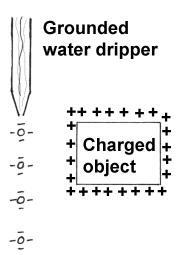 The positively charged object draws an excess of negative ions into the tip of the water dripper, then when the drop detaches, it carries away negative charge, leaving the earth slightly positive. Interesting is that the positive object need never to loss its charge, and the energy is all created by the work that gravity does in pulling the negative droplet away from the grounded dripper. If the "object" was negative, the droplets would be positive. It need not to be a "dripper", it can be a high velocity spray, as long as the jet divides into droplets, not a contiguous stream. And multiple jets can be used, sort of like a shower head. 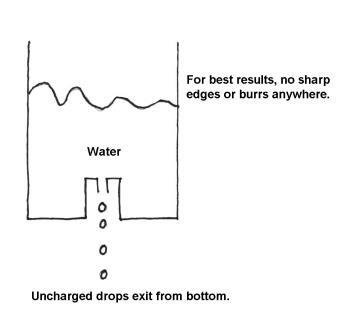 The dripping system is electrically unstable, and will if one side is a tiny bit more positive and the other a bit negative, these charges will amplify and grow as the water drips. 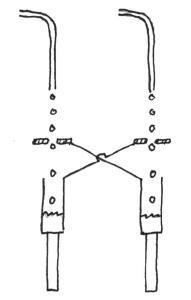 Eventually the charged drops falling into the like-charged cans will be repelled, and they will start bending their paths, even occasionally falling upwards. Picture showing the path of the water drops. 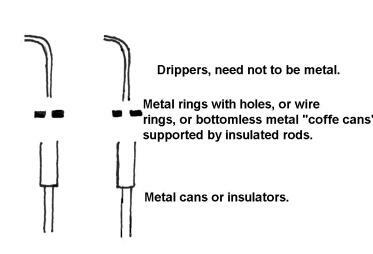 How to get the water out of the cans without discharging them ? By using the "faraday ice pail" effect where a conductive hollow object always has no charge inside. Connect an exit tube inside each lower can like this, so the water DRIPS out (if it falls in a solid stream , the cans will discharge). With a little catcher-tray and a fountain pump, you can make the system recirculate. Four toroid shown cross-sectional. Conical screens in tori touch droplets and release discharging them. Entire screen assy must be deep withing the "hole" of each donut so the torus shields it from the field on the outside. 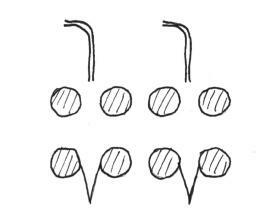 High-velocity waterjets and hollow-pipe conductors complete the scene.